United Nations Secretary-General Ban Ki-moon has announced the launch of the official UN account on WeChat, one of the largest social media platforms in the world with around 400 million users. This particular initiative will see the UN boost its social media presence in China, as the country is home to 1.15 billion cell phone users and over 600 million active internet users. The launch came just ahead of the Secretary-General’s four-day official visit to China from 18 to 21 July. This will be the Secretary-General’s sixth visit to China since his appointment in 2007. On 13 June, the Secretary-General launched the account from New York with a video message broadcast on WeChat and other social media platforms. He expressed his pleasure at the launch of a pioneering new service to allow the UN to interact more closely with the people it represents. “I hope that this UN WeChat will enable many Chinese citizens to understand the latest news and information about what we are doing — and why it matters,” he said. WeChat users are invited join a Q&A session by submitting questions for the Secretary-General through the new UN WeChat account. A number of the questions will be forwarded to Mr. Ban and his answers will be shared on WeChat throughout his visit. The account will also be used to share regular updates over the course of the Secretary-General’s visit. During his visit Mr. Ban will hold meetings with President Xi Jinping, Premier Li Keqiang, State Councilor Yang Jiechi and Foreign Minister Wang Yi, among other officials, to discuss issues of common interest. The Secretary-General will visit a Ministry of National Defense peacekeeping training centre in Beijing, attend a workshop on clean energy held by China’s Industrial Energy Conservation and Clean Production Association, and hold talks with Xie Zhenhua, Vice Chairman of the National Development and Reform Commission. He will also celebrate an important milestone in the UN’s social media engagement in China, as it is anticipated that the official UN Weibo account will gain its four millionth follower during his visit. Mr. Ban will present the 4,000,000th follower with a certificate to commemorate the occasion. 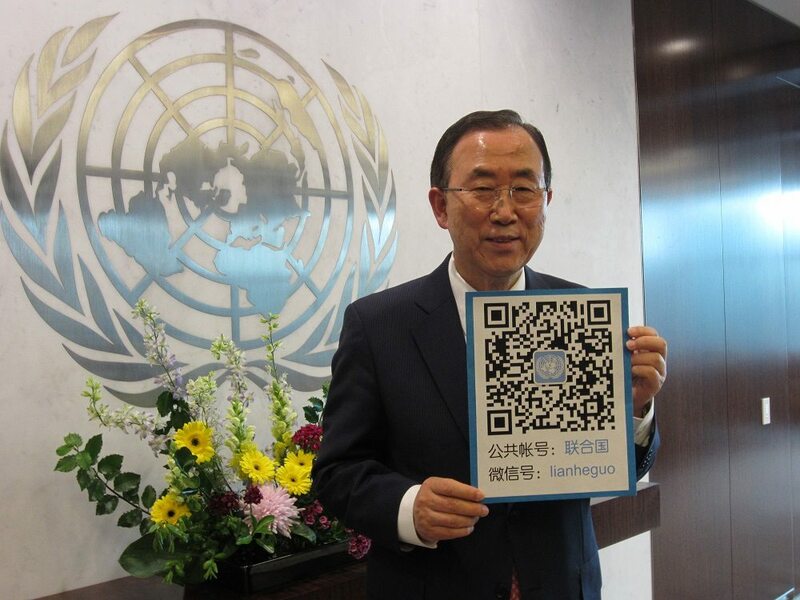 Secretary-General Ban Ki-moon has launched the new UN WeChat account.